We hope that this will help you find the tablet that best fits your demands. If you have any questions, feel free to ask below. We will try our best to answer them or find someone who can. If you like this, feel free to share this with friends and family. We even have a convenient share box off to the right. If you found an error or have suggestions for improvements, please let us know. 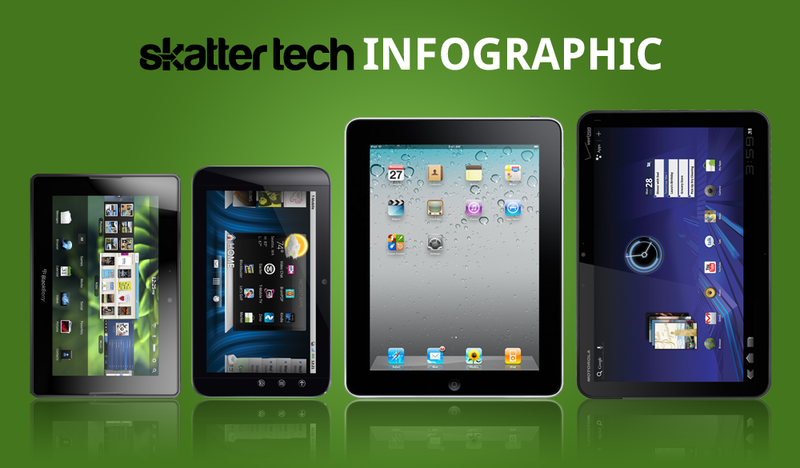 To stay informed about upcoming infographics, just subscribe to Skatter Tech. That is a typo for sure we will fix it shortly. Thanks for catching that! The iPad 2 will be announced very soon — probably later this month. Why not wait until then? You are comparing Android tablets that are not released yet to the iPad, which is now almost a full year old. I don’t know why you are complaining, the iPad is the winner in this info-graphic. you dont know what you are talking about. the iPad will sell more than the xoom or playbook. android is unsafe and proprietary. iPad is the best. …are you 12? and blind? “android is unsafe and proprietary”Chuckle.Easy there Apple fanboi, your complete lack of knowledge is showing. Wow. Never made it past a 3rd grade review and analysis capability? How could a sentient being review this graphic and not see that the iPad was blown out of the water by the Xoom?? Love is truly blind. As to the potential generational mismatch, the pad market will (of course) be a quarter-by-quarter leapfrog gestation, but the ultimate winner will be Android in its many variations because Apple never reviewed the case studies of Sony/Betamax vs. RCA/VHS. Apple is out-engineered by an army of brilliant engineers and UI specialists across many companies, all using the same OS: Android. Apple will be relegated to a minor player within 3 years. Probably still 1-2 months away if they are following their 12 month launch cycle. The purpose of this infographic is not to bash the iPad, but rather to offer a point of reference. I wouldn’t be surprised if Apple continues to sell more original iPad units than the Motorola Xoom after launch. Apple is the clear market leader since they were ahead of the game, however competitors are just beginning to close in. We will likely make new infographics, which include the upcoming Apple iPad 2 and iPhone 5 over the next few months! Had you (been able to) read that, you would have recognized that they knew they were comparing year old tech to new stuff, but because it was the monster on the market it was added for comparison. “Even though the hardware is nearly a year old, it has butchered competition selling over 7.33 million units in just Q4 of 2010 making it the best-selling tablet on the market.”Of course, slaughtering the competition when there is none is not a huge feat. Kudos to Apple for creating (or should I say reinventing) the tablet, but let’s see how they do with some actual competition this year. We’ve already seen how Android has taken over the smartphone market (and is still growing), I wouldn’t be surprised if the same thing happens with tablets.Though to be honest, I don’t really see the appeal of tablets in the first place – not portable enough to do what my smartphone does, and for that price your well on your way to a decent desktop. I think the Playbook is the only concept that really makes sense, given that it’s also marketed toward business types. Giving salespeople one of these lets them have an entire presentation in their hands without having to lug around binders of info-sheets and specs. Or doctors constantly moving around the hospital and having a tablet to quickly look up patient’s info. Etc. Of course other tablets can also try to get into this market but most are instantly disqualified due to their size (one hand on a 10-incher is too awkward) and none have the business brand that RIM does. The iPad does have a gyroscope. How else would the orientation change? Also, the iPad does have apps that provide turn-by-turn navigation, though I suppose you’re comparing stock apps. You are correct sir – we only include stock applications in our comparisons. Also, the iPad senses orientation change with an accelerometer. I’m fairly certain that the only Apple product with a gyroscope is the iPhone 4. The main difference is the gyroscope can sense rotation while the accelerometer cannot. Hi. Love this, perfect timing, as I’m thinking about taking the tablet plunge. Can you or anyone tell me which tablet might have the best handwriting capture software/apps available? Also, do any (most?) of these have compatibility with MS office? Do the androids require Google docs? They all have document viewers by default for sure. Editing capabilities usually costs a bit extra. However these tablets may include support out of the box. Android tablets can use Google Docs in a browser, but they are not restricted to it. If you grab the right app, it will do Microsoft Office just fine. As for handwriting recognition, no. These are all capacitive screen tablets. A pen won’t work on it. If that is a must, you may want to consider a Windows 7 tablet. We got these specs directly from RIM and Sprint. I believe we got both the proximity sensor and light sensor information correct. There is no DLNA support according to the latest information from CES 2011. The Sprint model was announced with support for 4G, it would be very surprising if there was no 3G module in there as well. While 4G is a jump up, the coverage is still very limited. No one would pay monthly fees for a device that can not even pickup 4G signal. As always, if there is something inaccurate, please let us know. We hate it when we make errors. Since you are happily comparing unreleased tablets vs. released tablets, why is the Dell Streak 7 on your list? Since ‘soon to be released’ tablets are obviously safe to put on your list, why not the LG G-Slate instead.Seems to me, the only 4G Honeycomb tablet (correction, the only tablet Honeycomb, 4G or otherwise) that will be on the market this quarter with a dual-core 1.2GHz Tegra 2 3D processor (not, the slower 1GHz Tegra 2 that everyone else is using) that can render 3D content right on the screen, that can take 3D stills as well as HD video in 3D (thanks to the 3D camera array on the reverse), and even output 3D content to 3DTVs via the HDMI 1.4, would be a shoe-in to make your list of the best tablets on the market this spring.Mentioning, why even put this list together just days before WMC, where HP (Palm Tablet) and HTC (Honeycomb) are both expected to unveil their tablet offerings? It seems a bit odd, that with more competition incoming from serious competitors, you create a chart leaving some of the biggest players off the list . . . just days before they have their official unveiling.I’m just sayin’. There were numerous tablets at CES 2011 from Acer, Asus, Lenovo, MSI, Notion Ink, Panasonic, Viewsonic, Vizio and more. We first narrowed the list down to a set of tablets that have known specifications. After that, we hand picked three that we felt were important. Details about the LG G-Slate was not announced until a day after we published this. The market is moving so fast that we simply can’t wait for every tablet to be announced before making an infographic. On that note, we will be attending the Palm HP event next week and will keep an eye out for the HTC tablet from Mobile World Congress. We will likely create another infographic in the near future include those upcoming tablets and possibly even the iPad 2 by then. I’d be interested in seeing the default, out-of-the-box codec support added to this comparison, where known. Being able to play back HD mkv files is very important to me when deciding what kind of tablet I’m in the market for, and while I know that at least a couple of these have GPUs that will handle 1080p playback, that’s kind of meaningless without codec support. Good point. Duly noted. Any preferences on which codecs we should focus on? I’m guessing MP4 and DivX would be a good start? I sure love the iPad, but I’m not brainwashed so I wouldn’t say “android is unsafe and proprietary”. Do you mean “unsafe” like a device in which circumvent the password screen and gain full access very easily? And the bug comes back and forth with each update? And do you mean “proprietary” like you when must go to the brand’s online store to buy the applications for the device, thoses apps which can be only developped on the brand’s computers? Right in the face! Ouch! Playbook has a compass, magnetometer, 6-axis gyro and a GPS. check this video out from 9:00. I don’t know they missed it out in the comparison sheet. We are trying to have someone at RIM confirm these details, please bare with us. The items of question are the compass, magnetometer, and the gyroscope. We know it has GPS for sure, but a voice-guided turn-by-turn navigation app has not been announced to date. I’m not sure how getting naked together will help anything, so I respectfully decline. Plus, I hardly know you. Feel free to post pictures, though. great chart, please keep it updated or add more models – we should see few new tablets in February. This chart was designed to make the Motorola Xoom, which isn’t even shipping, look good. How much did they pay you? Which one’s the best then? Please point that out. I want the best. If the webmaster is lying, then which one is best? Do none of these have styluses?? Even if not, you should have it listed… most people want a tablet with a stylus! Hopefully the next ipad will support one – if so, it would put it another notch well ahead of the rest. The RIM playbook is doomed… they have such terrible support for developers!! Just go to http://apple.com/developer and http://rim.com/developer and see the difference. And no… I’m actually far from an apple “fanboy”… but call a spade a spade. I would love someone to usurp apple in the tablet arena!! All these tablets feature capacitive touch screens. A traditional stylus requires a resistive display. Writing on one of these would not detect pressure of a pen since it has a glass top. There are special pens for these capacitive tablets, however they are not great for writing or drawing. Nice find. We’re trying to confirm who owns that website. It looks like some sort of marketing agency. We just want to double check that they do indeed work with RIM. This also is interesting considering there has been no word about a Verizon Wireless iteration until this document just came up. We’re definitely adding the Samsung Galaxy Tab 10 and the HP TouchPad to the list. We’re deciding on the G-Slate since it still seems a bit far-fetched due to 3D capabilities. What do you guys think? Yes for LG? Yes, we are past MWC2011… LG was introduced and it is coming soon. When will yop update the list? any news about update of this graphic above? We’re on it, hopefully within a week. There are always some odd specs left out of product spec sheets and press releases, which require nagging the respective companies to give them up. I guess this would need to be updayed now. The Xoom looks less like the ideal tablet now, and if you include pricing well, I guess that will be a deciding factor for many. I guess this would need to be updated now. The Xoom looks less like the ideal tablet now, and if you include pricing well, I guess that will be a deciding factor for many. Can you please update this Chart with iPad 2 features and the recently release Playbook Features (GPS, Orientation Sensor (Accelerometer), 6-Axis Motion Sensor (Gyroscope), Digital Compass (Magnetometer)? i want to buy a tablet pc and i’m not able to decide between Motorola Xoom Blackberry Playbook Acer Iconia A500 plz help me out! !